Notices, Events, Schedules: Regular Fireweed Fiber Guild Meeting will be Oct 20th at the Soldotna Public Library. We begin around 5:30, show up when you can. We will have tea, snacks always welcomed, bring your current portable fiber project and join us!! Notes-Continued: Festival...good question, just another issue that needs definition. It was a positive happening, I was shopping at Fred Meyers a few days after the festival and a total stranger came up and said, ‘You were part of the Fiber Festival, good event, thanks’...and she smiled and walked away...good feed back also from parents, special thanks to Jules and Renee on their ’kid friendly’ demos, as well as our efforts. There were many good things that happened, and yes, there was much we could do better, keep your notes, thoughts, ideas and join us at our next monthly meeting, Oct 20th. I had thought to have our Oct meeting at my new place, but Martha reminded me that many got the message that our meetings are the 3rd Thursday, at the Soldotna Library. Not everyone signed up on our sheet, so to insure we don’t have bodies show up where we are not, we will have the meeting in Oct at the library per usual. I have tossed out a lot of issues to be addressed, please don’t be discouraged, but see this as a time to grow as a Guild and to allow us to continue to develop a quality event the community will support and look forward to. Sale/Trade Items:  Deb, you purchased a loom from Sharon, but you need clamps that you did not take. Please contact her at [email protected] to p/u your clamps.  Perscilla Mott has some wrapped, small bales of hay at 80 to 100lbs for sale. These can be stored without shelter, just on a pallet. Call her and try something different at 262-2871.  It was a good year for hay, so if you have not gotten your winter hay, let me know, I have a few other reliable folks that produce a good quality local hay and I can provide you with contact phone numbers. Good space for Sale/Trade/Need to Buy segment…..let me know before the end of the month and I will post your item, no charge, 185 people on the list now, Peninsula wide coverage. What is the Fireweed Fiber Guild? It is a group of persons working together to provide; networking, resources, information and support for fiber artists and fiber producers. Fireweed Fiber Guild is a 501c3 Organization. If you bring your wheel, bring a variety of handspun or commercial singles or multi-ply yarn, prime or second grade, thick &/or thin, some fiber, whatever you want to work with.......she will also show how to re-cycle a sweater if there is interest....bring the sweater. We can also set up a share table if you want to get rid of some yarns and trade off with something else on the table. Sorry again for the delay, send good thoughts for a simple fix on my computer, I feel like I have lost something without it! "Just inside the entrance to the exhibit hall Lee Choray-Ludden, Martha Merry and Jane Conway were running one of the fair’s more exotic petting zoos. Alpaca, Navajo Churro sheep and dyed mohair goat were just some of the animals available for roving hands to feel. Unlike traditional petting zoos, these creatures were kept in peanut-butter-jar sized containers, and it was only their sheerings. 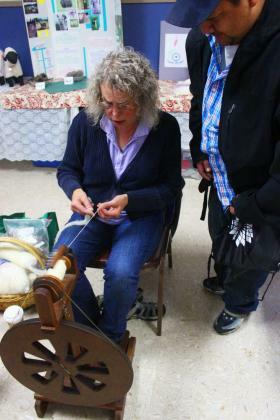 The three women were running the educational booth the Fireweed Fiber Guild has been hosting at the fair for three years, Choray-Ludden said, as her socked feet pumped the foot pedal of a dark brown spinning wheel. The guild has been in operation for about five years now, Churay-Ludden said. There are over 100 members on their monthly newsletter list, and at least ten active members that meet regularly. Conway said the group was “producer-oriented.” Many of the members also own their own livestock that they sheer their fibers from. She owns tens of sheep, and Choray-Ludden owns 25 goats. Members of the guild know how to handle fibers since they are taken off the backs of their own animals, Choray-Ludden said. 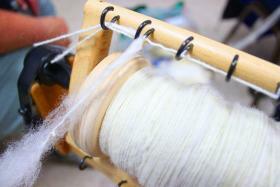 Beginning with sheering, they are then washed, processed, spun and woven into various products. Unfortunately there are no fiber mills in Alaska, Churay-Ludden said. 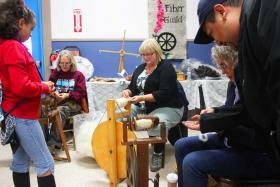 In response, many of the guilds members have joined the Alaska Natural Fiber Business Association, a non-profit working to create more options for fiber producers in the state. The organization is researching how much fiber is produced in the state, Choray-Ludden said. When they have figured out the numbers they can apply for a grant that may result in building a mill. However, Merry said many people are able to hire out aspects of the process they are least interested in. There is more time for the parts spinners enjoy most, she said. Choray-Ludden said she enjoys dying her fibers. She pulls out short strings of vibrantly colored yarns labeled names that together sound like salad made with local flora. Conway pulled out a thick wrap the deep, mustard-yellow tint of turmeric, but said it had been dyed with onionskins. “Wild berry mix,” “horsetail,” “lupine blossom,” are some of the natural plants used to make the dyes the guild uses to color their yarn, Choray-Ludden said. There is so much to do with fibers, she said. So much she herself doesn’t even have time to explore them all. The fair is a great place to be to educate people about what is going on in the fiber producing community, Choray-Ludden said. Telotha Braden and her father Mario Reyna wandered up to the three spinning wheels. “I came here last year,” Braden announced to the women. Braden asked a few questions and felt the different piles of fibers sitting on Merry, Conway and Choray-Ludden’s laps. Reyna asked a few after his daughter. Fireweed Fiber Guild members Lee Choray-Ludden, Martha Merry, Jane Conway answer questions from Telotha Braden and her father Mario Reyna, Friday, August 15, at the Kenai Peninsula Fair in Ninilchik, Alaska. Siblings Chase Stephens and Taylor Dobson ran through the mud, between the swing ride, which they road under a clear sky, to the tilt-a-whirl, which they entered under dark gray clouds ready to let loose. However, the two were smiling, unconcerned about the next downpour, and decked out in white plastic one-time-use rain jackets. Just inside the entrance to the exhibit hall Lee Choray-Ludden, Martha Merry and Jane Conway were running one of the fair’s more exotic petting zoos.